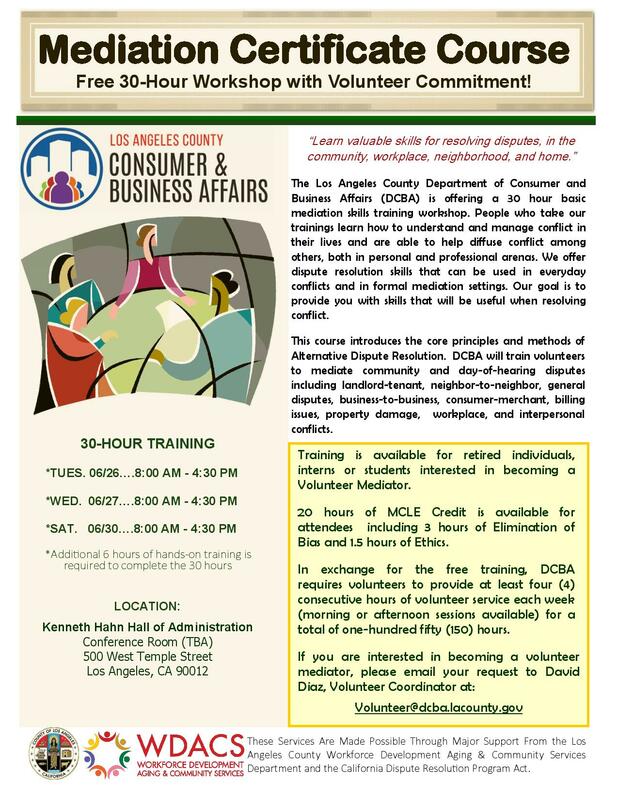 The Los Angeles County Department of Consumer and Business Affairs (DCBA) is offering a 30 hour basic mediation skills training workshop. People who take our training learn how to understand and manage conflict in their lives and are able to help diffuse conflict among others, both in personal and professional arenas. We offer dispute resolution skills that can be used in everyday conflicts and in formal mediation settings. Our goal is to provide you with skills that will be useful when resolving a conflict. This course introduces the core principles and methods of Alternative Dispute Resolution. DCBA will train volunteers to mediate community and day-of-hearing disputes including landlord-tenant, neighbor-to-neighbor, general disputes, business-to-business, consumer-merchant, billing issues, property damage, workplace, and interpersonal conflicts. *Additional 6 hours of hands-on training is required to complete the 30 hours. Training is available for retired individuals, interns or students interested in becoming a Volunteer Mediator. 20 hours of MCLE Credit is available for attendees including 3 hours of Elimination of Bias and 1.5 hours of Ethics. In exchange for the free training, DCBA requires volunteers to provide at least four (4) consecutive hours of volunteer service each week (morning or afternoon sessions available) for a total of one-hundred fifty (150) hours. These Services Are Made Possible Through Major Support From the Los Angeles County Workforce Development Aging & Community Services Department and the California Dispute Resolution Program Act.